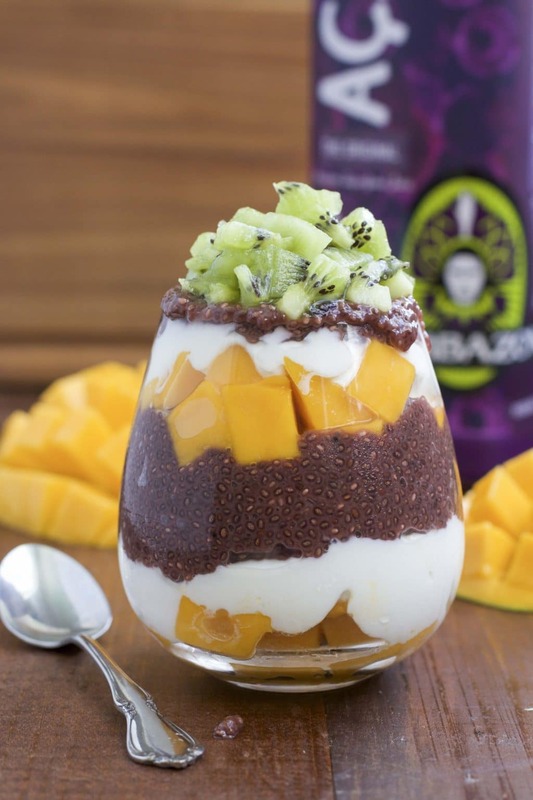 Protein-packed acai chia seed pudding layered with coconut yogurt, mango chunks, and topped with fresh kiwi! Perfect for a quick breakfast or healthy snack. Vegan. I just recently discovered chia seed pudding a few months back. Now it’s one of my favorite easy breakfasts or quick snacks. I like to load it up with lots of fruit or you can mix in some oats, nuts, or seeds. I love that it’s so simple to prepare. You mix up the chia seed pudding the night before, put it in the fridge and you’re ready to eat in the morning. So easy! The preparation is similar to my other favorite quick breakfast –> chocolate peanut butter protein oatmeal that I make in the crockpot the night before. The first few times I made chia seed pudding, I mixed the chia seeds with coconut milk and fresh mango puree for cherry mango chia seed pudding parfaits. I still love that version but I picked up a bottle of fresh acai (ah-sigh-ee) juice at Costco last week and fell in love! far outweigh the sugar factor. Acai is loaded with antioxidants and heart-healthy omega-3 fatty acids that you find in fish. Acai is a grape-like fruit that comes from acai palm trees that are native to the rainforests of South America. It’s harvested from the palm trees that are also used for hearts of palm. Acai juice is sweet and tastes like a mix between grapes, cherry, blueberry, and strawberry to me. It’s delicious! We’ve been making smoothies and smoothie bowls with it all week. So, I thought why not use the acai juice as the liquid component for the chia seed pudding instead of coconut milk? soak up all the sweetness from the acai juice and you’re left with a jam-like consistency that tastes so good mixed in a parfait! In the parfait, I put a layer of mango chunks, acai chia seed pudding, coconut yogurt, and a layer of diced kiwi. It’s tropical and light, perfect for a quick breakfast or healthy snack. 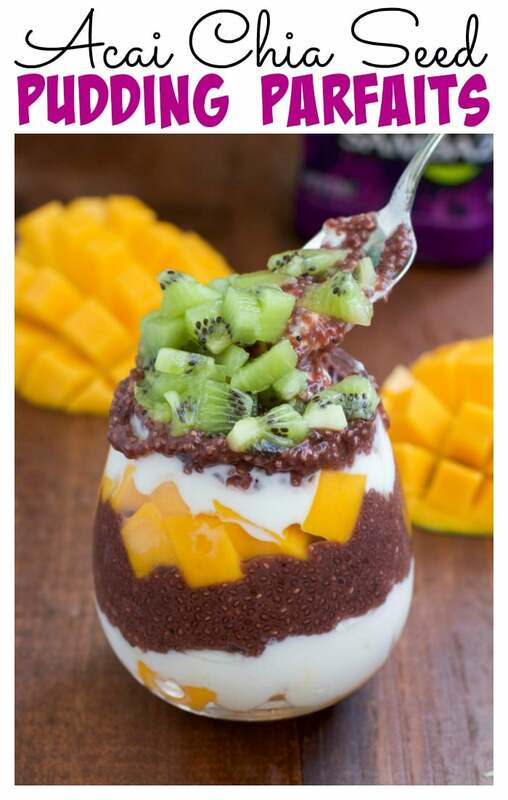 Protein-packed acai chia seed pudding layered with coconut yogurt, mango chunks, and topped with fresh kiwi! Perfect for a quick breakfast or healthy snack. Stir the chia seeds and acai juice together in a bowl. Mix well. Cover and refrigerate for 8 hours or overnight. The chia seed pudding will be ready in the morning. 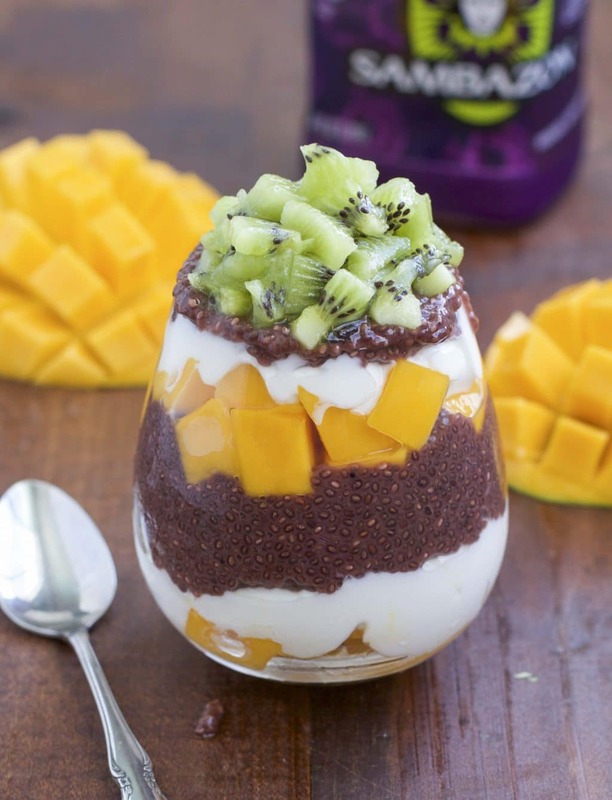 Layer mango, coconut yogurt, chia seed pudding and kiwi in a parfait cup. Enjoy! If you make this acai chia seed pudding parfait and post it on Instagram, please tag it using the hashtag #StaceyHomemaker so I can see your beautiful creation! Have you tried chia seed pudding yet? What’s your favorite way to eat it? Let me know in the comments!